Model cars teach students about motion along inclined planes, friction, gravity, momentum, and potential vs. kinetic energy. 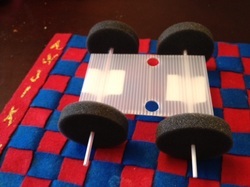 These model cars consist of a simple chassis and a straw-based axle system (simple machine) that produces minimal friction and allows the cars to roll with little energy input, making them ideal learning tools for students of all ages. 1 clear plastic straw, 2 coffee stirrers, corrugated plastic chassis, 4 foam discs for wheels, labels, plastic container with sand (cargo), and large plastic ramp. Objects that can be used as cargo like erasers, tiny toys, small bowl, or coasters. 1. Cut the clear straw in half. 2. Center one piece of the straw to the corrugated plastic chassis. Tape one half of the cut straw to the chassis with one of the labels provided, ensuring that it is entered across the width. 3. Insert one end of a coffee stirrer through the hole in one of the foam disks until 1" of the stirrer pokes through the other side of the disk. 4. Insert the other end of the coffee stirrer through the clear straw taped to the to the chassis. 5. Insert another foam disk onto the remaining end of the coffee stirrer. 6. Repeat steps 3-5 for the other end of the car. Roll the car on a flat surface to ensure the disks turn freely. 7. On a flat surface, mark the starting line. Give the car a gentle push from the starting line. mark the ending point or distance traveled. 8. Position the ramp (inclined plane) so that its base is at the starting line. Push the car down the ramp gently and note the distance traveled from the starting line. 9. Did the car travel farther from the starting line now than when it was travelling on flat, horizontal surface? Why or why not? 10. Cover the ramp with different materials to explore surface friction. For each material, roll the car down the ramp, noting the distance traveled from the starting line. Based on observations, which material produced the most surface friction? 11. Attach the "sand cargo" to the chassis with a tape and roll the car down the ramp gently. How does changing the mass of the car affect its momentum and velocity? The wheel and axle are one of the six simple machines. Machines make our work easier by changing either the size and/or the direction of an input force. A wheel and axle combination consists of two circular objects of different sizes, with the larger wheel turning around the smaller axle. The friction between the wheels and the surface below, plus the friction of the axle rubbing in the axle supports, slows the car. For each rotation, the axle travels a shorter distance around than the wheel. The shorter turning distance and smaller diameter of the axle means less energy is lost as the car moves. If the car is placed on a flat surface that is parallel to the ground, the car will not move on its own because there is no force pushing the car. If a car is at rest on a flat surface and no horizontal force is applied, the car will not move. If a horizontal force (push) is applied to the front or rear of the car, it will roll forward. Applying a horizontal force to the car will cause the car to roll in the direction you push it. The friction force will act opposite the direction of the applied force and slow the car down. The distance required to stop the car will depend on the amount of force applied or strength of your push. In other words, the harder the car is pushed, the farther it will travel but it will eventually stop. When the car begins rolling down the inclined ramp, it is the gravity pointing along the incline that causes the car to move. The magnitude of gravity will depend on the angle of incline or steepness of the ramp. 1. Place binder clips, paperclips, a small bar of soap or other items to the car to change its mass. 2. Adjust the ramp height (incline angle) and repeat step Compare new observations with previous observations. Discuss with a partner and explain any differences you noticed. Investigate the minimum ramp angle required to start the car in motion down the ramp. 3. Determine the type of ramp surface covering that produces the most friction. 4. Create a sail and determine the maximum distance the car will travel on a flat surface using the wind from a small fan to move the car.